This wine is perfect for celebrating when one of your buddies drains that hole in one. It has complex varietal character exuding black fruit, pepper, and lavender. Grown on a hill side similar to that of the 17th hole at Pebble Beach, it was bottled unfined and unfiltered to maximize the pure potential of the vineyards.! Many believe this to be the finest merlot Firstfairway has ever made! From James L of Napa, California on 1/10/2003 . Winemaker Danny Noonan has done it again. This 1999 Vintage of the Hole in One Merlot is his the finest to date. Good full ruby-red body. Cassis, bitter cherry, dark raspberry and tobacco leaf on the nose. Fat, sweet and lush; full, chewy and deep in the mouth. Finishes vibrant and long, with lush tannins. This wine is a winner. 5/28/2003 – Do I get a discount on this wine if I buy an entire case? 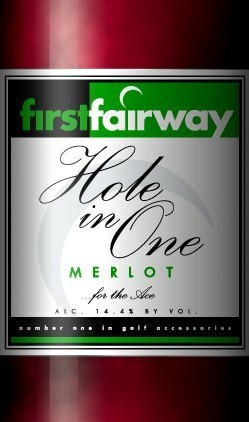 Response From FirstFairway: Sorry, the Hole in One Merlot is in such high demand that we are unable to offer discounts at this time.